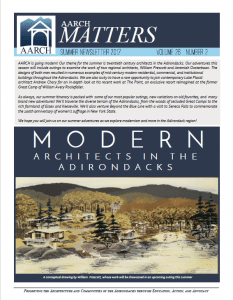 Adirondack Architectural Heritage publishes two newsletters annually — our Winter Newsletter and Summer Newsletter (also known as the Summer Tour Schedule). We also publish an annual recap of our activities and accomplishments known as the Year-in-Review. To read our current and past issues of AARCH Matters, our bi-annual newsletter follow THIS LINK. To read our current and past issues of our Year-in-Review, follow THIS LINK. For a paper copy of recent issues, please contact AARCH.